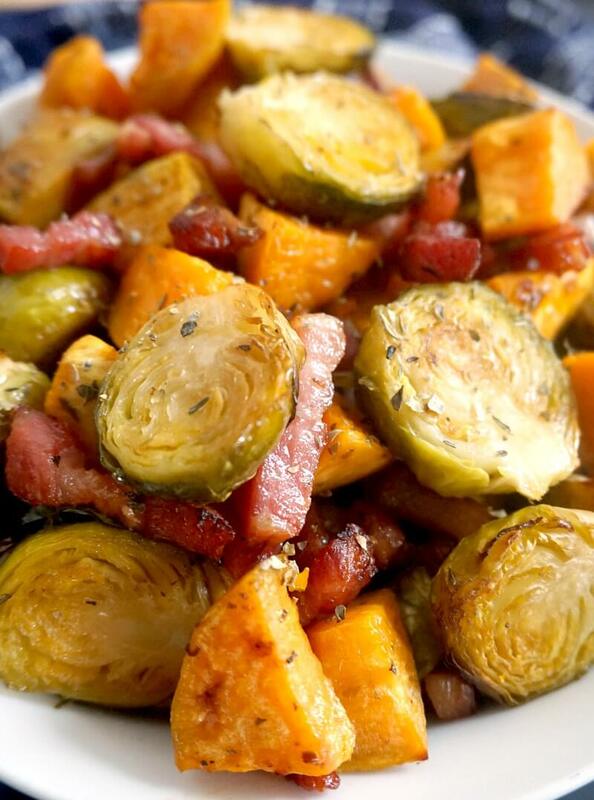 Maple Roasted Brussel Sprouts with Bacon and Sweet Potatoes, a delicious side dish for your Thanksgiving or Christmas dinner. Super easy to make, and super flavourful, this dish has a festive touch. Only one tray needed, to save you time and effort. A family-favourite side. Thanksgiving is just around the corner, and not long till Christmas either. No time to wonder where the year has gone, there is so much preparation to do for the two big holidays. And since Thanksgiving comes first, I’m sure all those pumpkin goodies have already been carefully selected for the day. Turkey is everybody’s favourite, although I never say no to the good old Roast Chicken either, especially if, like me, you don’t have a large family to cook a whole turkey for. And what does a good roast need most? A good side dish, of course. And here is the thing, love them, or have them, Brussels sprouts must be the most popular veggies at this time of the year. 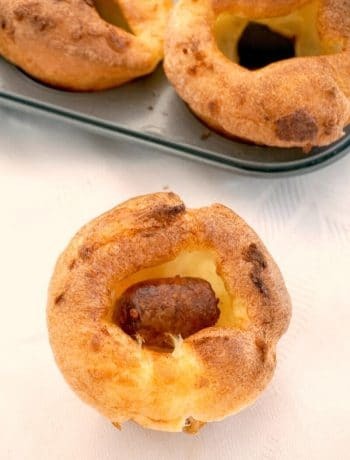 Surely, the easiest way to cook them would be boiling for about 10 minutes until tender, but you would never get the same depth of flavours you get from roasting. And since the prep is minimal, and all you have to worry about is one tray to clear after, it only makes sense to go for the roasting option. The sweet potatoes, for instance, get a lovely caramel-like taste, enhancing the natural sweetness at the same time. 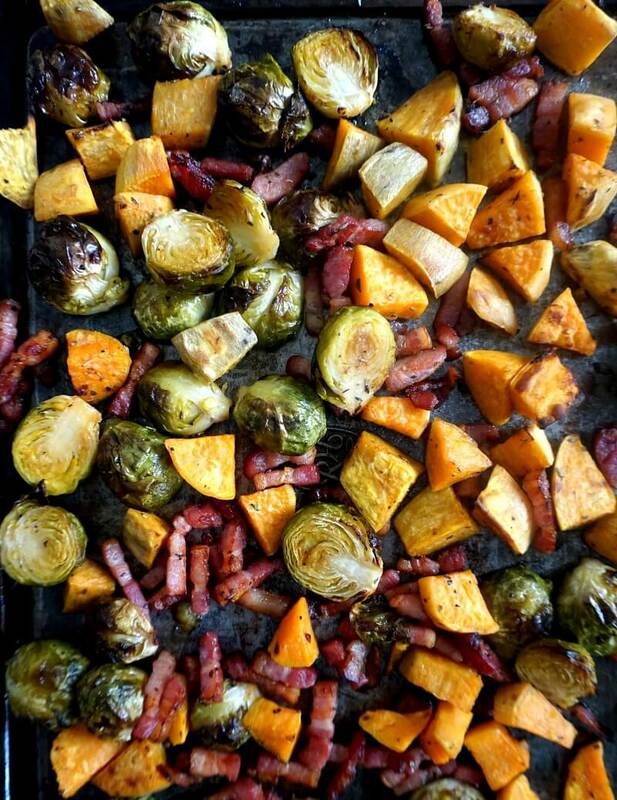 Plus, roasting the bacon at the same time with the veggies brings extra flavour, and if you add a bit of maple syrup, or even honey, you know the dish can’t get any better. Of course, you can throw in any other veggies, like shallots, carrots, some cloves of garlic, and even sprinkle some parmesan over when you get them out of the oven. A few tips here to get the most of your roasted brussel sprouts dish. Make sure the oven is well preheated before adding the bacon first. The bacon will release quite some fat, I used bacon lardons, but you can also use a few rashes of bacon and chop them up. After 10 minutes, add the maple coated brussel sprouts and sweet potatoes, and roast for a further 40 minutes, until everything is cooked through. If you add everything together from the beggining, the veggies will become too greasy from the fat released by the bacon, which is why I prefer partially cooking the bacon first, then add some olive oil to the veggies. It’s a lot healthier this way, and a lot lighter too. If you want to cook Brussel sprouts in a different way, why not try the Brussels Sprout Casserole with Chicken and Walnuts? 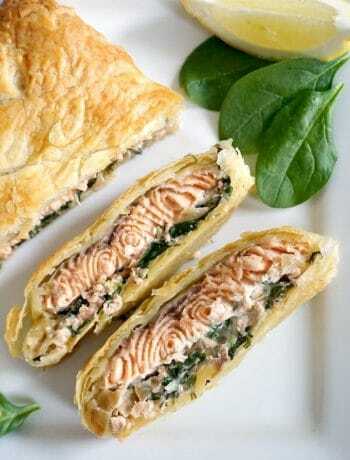 It’s absolutely amazing, and super easy to make too. 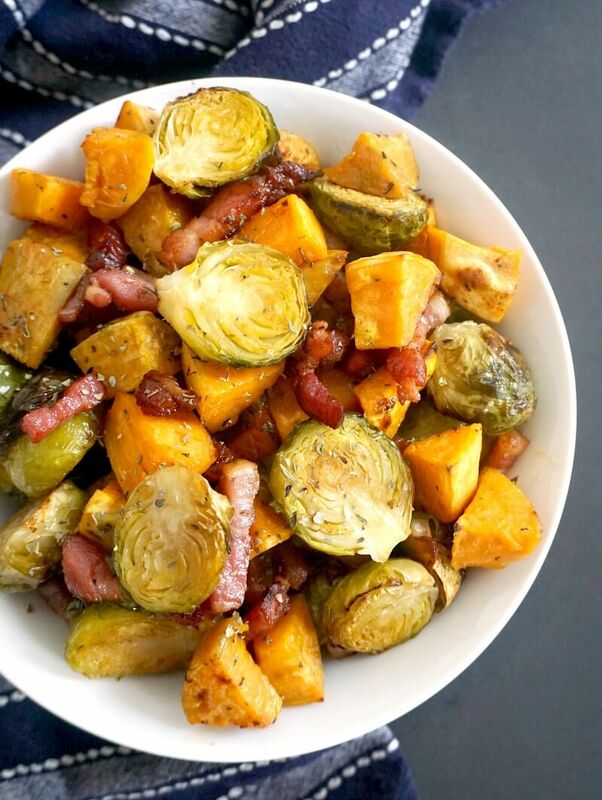 If you’ve liked my MAPLE ROASTED BRUSSEL SPROUTS WITH BACON AND SWEET POTATOES or any other recipe on the blog then don’t forget to rate the recipe and let me know how you got on in the comments below, I love hearing from you! You can also FOLLOW ME on FACEBOOK, and PINTEREST to see more delicious food and what I’m getting up to. 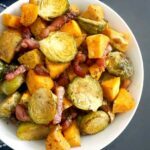 Maple Roasted Brussel Sprouts with Bacon and Sweet Potatoes, a delicious side dish for you Thanksgiving or Christmas dinner. 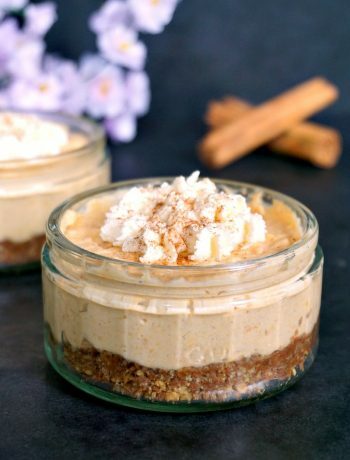 Super easy to make, and super flavourful, this dish has a festive touch. Only one tray needed, to save you time and effort. A family-favourite side. Scatter the bacon lardons on a large baking tray, and pop in the oven for 10 minutes. 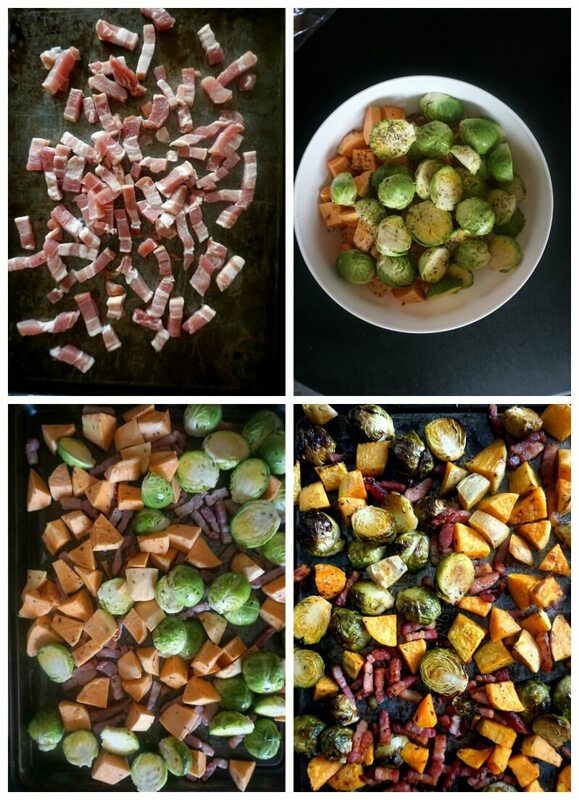 Peel and chop the sweet potatoes into chunks, then trim the brussels sprouts and remove the first outer layers. Cut into half lengthwise. Add the olive oil, maple syrup, salt and herbs, and toss well. After 10 minutes, add the veggies to the tray. Roast for a further 40 minutes until cooked through and tender, mixing occasionaly to ensure even roasting.